Here is a list of last minute holiday gifts for the teens, college kids and young adults in your life. We’ve included some of the most popular Grown and Flown gifts this year and we hope that it helps you to have them here, all in one place. We’ll include any info we receive about special sales and ordering deadlines so check back often for updates. We hope you and your families have a wonderful holiday and a happy, healthy 2019. Never get the, “Mom, I lost my keys, wallet, purse…” call from your teen again. These little squares slip into wallets, backpacks, and affix to keys. 2. Jack Black Skin Care This is our new favorite toiletries brand for guys and we think this shaving set is the perfect trio that your son will want to use to keep his skin in top shape. BTW, we LOVE the lip balms for guys and girls, so check those out, too. Purchase ASAP – currently in stock, but supplies are running low! 3. Project Repat Twin Size Custom T-Shirt Quilt Voucher If you want to give your teen a voucher for a twin size Project Repat T-shirt quilt, here’s where you can buy it on Amazon. After the holidays you can go through that stack of t-shirts, together, to make their custom t-shirt quilt that will be a sentimental and practical blanket they can take with them to college. Pay $89.99 for the voucher (regular price $109.99). 4. Yeti Insulated Mug There’s nothing quite like drinking hot coffee from one of the iconic YETI insulted travel mugs. They come in all sizes and colors and will be something your teen or college kid would absolutely love to receive. Some colors arrive after Christmas, choose various colors for various arrival dates. Some are still available to arrive before Christmas! 5. Allbirds Shoes We simply cannot say enough fantastic things about these shoes for both guys and girls. They are available in several styles – we prefer the lace up – and colors. They are extremely lightweight and, get this, they are machine washable. This is our very favorite shoe of all time! 6. Kendra Scott Jewelry We think this delicate bracelet is very pretty but take a look at all of Kendra Scott’s bestsellers before you decide. Order by 12/19 TO RECEIVE $5 2-DAY SHIPPING WITH GUARANTEED DELIVERY BY 12/24. 7. Photo Gifts Looking for a personalized gift for your teen but don’t have a lot of time to order one? Did you know that your local CVS can be your one-stop shop for photo gifts? CVS offers a wide variety of presents and you can build your gift at home and pick it up in the store when you dash in for more wrapping paper and tape. We think putting a photo of your family – or just the family dog – would be a perfect gift for your teen to enjoy now or to take with them to college next fall. 8. Sunrise Alarm Clock Waking up for an early class is brutal for teens but, with this LED alarm clock, they can customize the color of the light to simulate sunrise and they can add nature sounds for a more blissful morning. It also has an FM radio and, with eight color options, can serve as a bedside table lamp, too. 9. Not Parent Approved If your family loves to play card or board games but Cards Against Humanity is a little too “adult” for tweens or young teens, this game may be for you. It’s is an award-winner, super popular, and is appropriate for everyone from little kids to grandparents. Currently on sale for $29.99! 12.Vineyard Vines Maybe because Vineyard Vines began operations in our neck of the woods and all five of our sons have worn VV clothes their entire lives…it is a favorite store of ours. 13. SPANX Leggings SPANX is about so much more than shapewear. Their leggings are incredibly popular and, do we even need to say, fit like gloves? Your daughter will love wearing the faux leather, velvet or just plain black leggings this holiday season. 14. Harper Crossbody Bag This crossbody has become one of the best-selling little bags that we have seen this holiday season. It comes in all sorts of cute colors, is very well-priced and appears on Oprah’s List of 2018 Favorites. Congrats to the Harper! Some colors are out of stock until after Christmas, select various colors for arrival before Christmas! 16. Pura Vida Bracelets These trendy bracelets are made by artisans all over the world. Through sales of their charity collection, Pura Vida has donated over $1.5 million to 174 non-profits. 17. Polaroid Zip Photo Printer How nice that there’s a fun and fast way to print and share real, paper photos! Polaroid has created a very old school and, at the same time, a very modern printer that your teen will love. The Echo devices keep getting smarter and smarter and your kid will love getting a Dot, now in it’s third generation. There are 50,000 apps – (WOW) – and some of the ones they will use right away are asking Alexa to play music, answer questions, check the weather forecast, and set alarms. Music can be streamed from Amazon Music, Pandora, Spotify and more. And now, with this model, they can make calls hands-free with compatible devices. This is a very popular last minute holiday gift. 19.Fire HD Tablet Fire HD 10 Tablet with Alexa Hands-Free is a tablet designed for entertainment and your teen can access millions (!!) of movies and songs, TV shows, Amazon Prime, and Netflix. Plus, you can choose from 570,000 free and best-selling games and apps and more than 425,000 Audible titles. Make hands-free calls with others who have an Echo device, too. Currently on sale for $49.99! 20. Avocado Cutter/Slicer Do your kids love avocados like ours do? 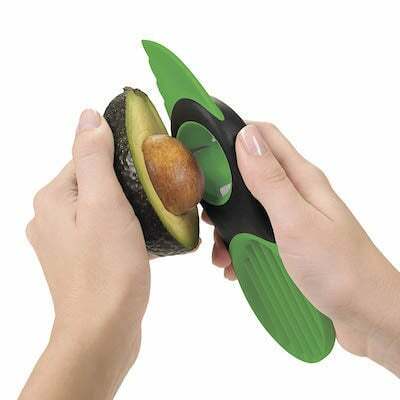 This all-in-one tool will revolutionize the way your teen or college student prepares avocados. This does it all, including getting rid of the stubborn pit, and it’s dishwasher safe. 21. 100 Movies Scratch Off Wall Art How fun is this? It’s a movie “scratch off” poster. It lists 100 popular movies of our time and, after your teen watches one of the movies, they can scratch off the box to learn a little bit of trivia about the movie. Perfect for that film buff on your list. 22. Favorite Team Gear Do your kids live and breathe for their college team or a team in the NFL, NHL, NBA, or MLB? They will be thrilled when they open this Fanchest box under the tree to discover loads of great gear.
. These offer alittle pampering in some favorite flavors. Lip balm is something everyone needs during the winter months. 24. Favorite Off to College Books The Naked Roommate and Do Your Laundry or You’ll Die Alone are our favorite books to give a college freshman or high school senior. Naked Roommate is guidebook that works equally well for guys or girls and Do Your Laudry is filled with life lessons for young women. We know both authors and recommend them to all of our friends whose teens are grown and flown! 25. Audible Audible is the perfect last minute gift idea for the book lovers in you life! 26. Sonos One Play songs, check news and traffic, control your smart home and enjoy all those other helpful Amazon Alexa skills using a single Sonos speaker. 27. Bose Wireless Headphones, Noise Cancelling, with Alexa voice control – Clear away the distractions of the world, and focus on what matters most. Go deeper into your music, work, and passions — with no noise in the way. Plus with Amazon Alexa, you can enjoy entertainment, get information, and manage your day. Just ask.